Every Notre Dame fan knew that the Irish couldn’t finish this class with only one defensive end. NaNa Osafo-Mensah‍ is a very good prospect, but having taken only Justin Ademilola at end in the previous class, the end position would be in trouble if Notre Dame came up short on signing day. 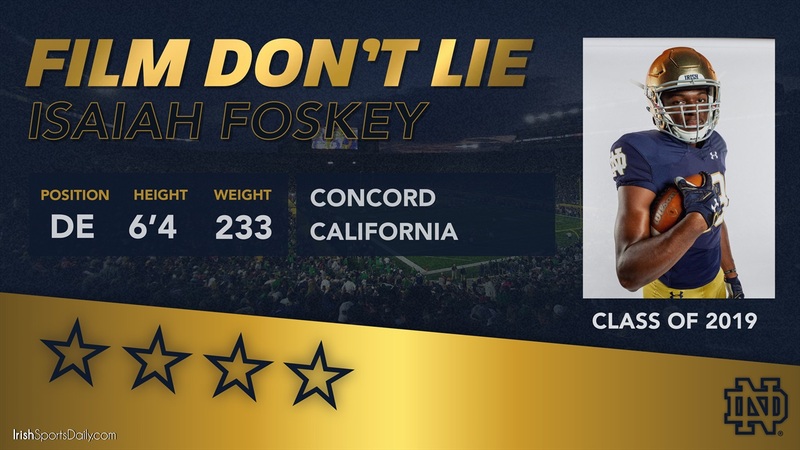 That didn’t happen as the expected occurred with Isaiah Foskey‍ signing his letter of intent today and being the last player to join Notre Dame’s 2019 recruiting class. Originally seen as a tight end prospect by many, Foskey showed why he has a bright future on the other side of the ball with a great senior year. This is terrific addition to the class not just because of need, but because Foskey has the potential to be a high end starter for the Irish. What I like most about Foskey’s game is that he is good at many things. There aren’t a lot of obvious weaknesses to his game. He’s a good athlete, but doesn’t rely on his athleticism. He’s not shooting gaps and only winning with his first step, although he has a good get off. It’s not a surprise that he looks well-coached based on the program (De La Salle) he’s coming from. It’s the way he utilizes all the skills he has learned that really stand out. As a pass rusher he knows how to convert speed to power and does a great job using a long arm to establish his power on this particular play. That’s something that may seem simple, but it can take some players years to get good at. He knows how to work the edge of the defender and has a good lean as a pass rusher that is essential to when it comes to finishing at the quarterback. Effort is so underrated when it comes to rushing the passer and Foskey is a high effort player that fights even when seemingly blocked. This is a perfect example of it with him working through the tackle and then the back before ending up with a sack. Throw in really good hand-eye, check the first play of his highlights, and he shows great potential getting after the passer. I mentioned that he was a tight end on offense for his high school and he has good pop as a blocker. I think that leverage learned from blocking as a tight end really helps him at end where he establishes himself with his punch and can be strong at the point of attack. He has the tackle back on his heels here, but that’s not the important part. It’s that he has established separation and can shed to make the tackle. On this play he is taking on the H-back and the job he does with his punch makes this an easy stop in short yardage. I think he’s more advanced a run defender than many other defensive end prospects. Like a lot of guys his age, he needs to improve his hands as a pass rusher. He needs to establish better initial moves and counters to go with it. His snap anticipation is a bit inconsistent right now. He flashes a good first step, but at times can be late off the ball. Some guys are so twitchy that they can get away with it. I don’t think Foskey is the kind of player who can. I believe Foskey has the potential to develop into an outstanding run defender setting the edge on the strong side and he can be a plus pass rusher as well. I also believe he is someone that could become major contributor early in his career. This year there will be a lack of opportunity due to the players in front of him, but I see him competing for the strong side end spot in his second year. He has the talent to be a multi-year starter and a very good one for the Irish.